"One student ran up to me and hugged me spontaneously and said, 'This is more beautiful than I could have imagined. Thank you for bringing me here.' This child is a high-risk student and his behavior at school changed dramatically with the anticipation of going to Crater Lake. This program was a gift of a lifetime for many students." —5th Grade Teacher, Three Rivers School District. The Classroom at Crater Lake project began in 2001. Formed as a Partnership between Crater Lake National Park Trust, Southern Oregon ESD, and Southern Oregon University, its mission is to develop curricula and programs that use Crater Lake National Park's settings and resources as a foundation for increasing student content knowledge in science. The program, which strives to deepen students' and teachers' appreciation of the cultural heritage and beauty of Oregon's only National Park, is currently open to 4th and 5th grade teachers in Jackson, Josephine and Klamath counties. Teachers attend a two-to-three day training in August where half of their time is spent at Crater Lake exploring the park and learning about its resources and the other half is spent exploring curriculum materials and learning about print, media, and Internet resources that match the Oregon Content Standards. The materials and resources can be used before and after trips to the park with their students. 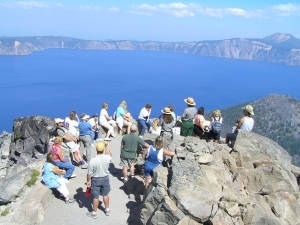 Teachers who participate in the training agrees to take their class to Crater Lake once in the fall and once in the spring. 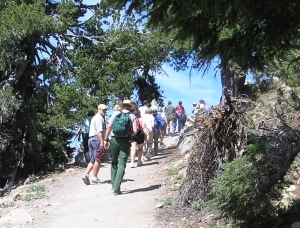 Park Rangers, who are learning guides for teachers and students, lead interpretive hikes and create situations during the hikes that help students make connections between science content and the outdoor environment. During their time at the park, students learn about the park's geology, forest habitat (plants and animals), the unique properties of the water in the lake, and the impact of weather on plant and animal life at the park. During the spring trip, students explore on snowshoes. Students continue the learning back in the classroom by using their real world learning experience to motivate and connect them with science content. The Crater Lake Trust and SOESD partner to provide support to the teachers including a facilitator, a small stipend for attending the training, curriculum materials, and a $50 bus reimbursement for each class trip. Applications for the 2008-2009 school year will be available in May 2008. Contact Teena Staller at (541) 776-6771 or teena_staller@soesd.k12.or.us for more information.